Seven days, that's how long the three leaders in BC have to convince people to vote for their party (or their candidates if you prefer). And with one week to go, there is enough uncertainty that we can't really make a call. Not because I'm chicken and don't want to be wrong, but because there is enough uncertainty (polls, electoral map, local effects, etc) that multiple scenarios are possibles. To be fair, we've had so few polls that the projections have been fairly stable. Yesterday saw the publication of the first poll of this campaign showing the BC Liberals ahead, maybe an important moment in this election. The Justason poll, conducted online with 1127 respondents (but only 768 decided voters) has the party of Christy Clark slightly ahead of John Horgan's. Compared to the previous poll from this firm, this is an increase of almost 2 points for the incumbent party and a corresponding drop for the NDP. The Green also increasing by two points, our first post-debate confirmation of what we were saying: Andrew Weaver likely won the first debate. The lack of polls has created a somewhat puzzling narrative in the media. Many people (and pundits, etc) seem to think that polls have all shown a large lead for the NDP. This isn't really true. What happened was this one Mainstreet poll with the NDP enjoying a a 10-points lead. A poll actually published around the same time as the last Justason one that was showing a much smaller lead for the challenger party but got way less media coverage. I have always been of the opinion that this was a very close race and I feel confident in saying that the next couple of polls will prove me right. 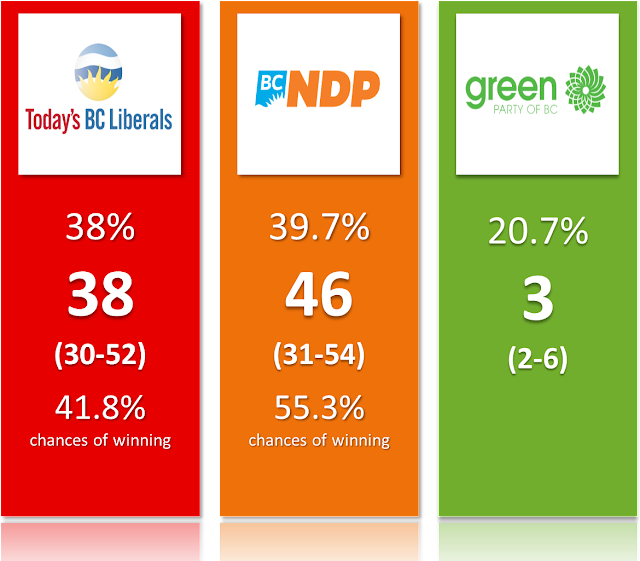 I have updated the BC Election 2017 page with all the details, but here are the latest projections. Don't be fooled by the 8 seats lead of the BC NDP. This isn't a safe lead at all. First of all, any small mistake by the polls -for instance an underestimation of the Liberals or the Green by a couple of points- could cut the number of seats sharply. There are also currently 17 ridings decided by fewer than 5 points. Among them, the BC Liberals are projected to win 4 and the BC NDP 13. The model currently seems a little bit unbalanced. My job during this last week will be to focus on these ridings and see what information I can find. But the 4-13 should show you that the BC NDP will need to get the vote out in some key ridings. The Green Party could well hold the key of this election. The electoral system seems incredibly unfriendly to it right now. Indeed, getting 3 MLAs (out of 87) with 20% of the vote is a really, really bad conversion rate. At least these three seats seem relatively safe (probabilities of winning go from 76% in Cowichan Valley to >99% in Oak Bay-Gordon head and Saanich North and the Islands). After come the possible surprises in Saanich South, the two Victoria ridings and Esquimalt-Metchosin. You also a couple of ridings with non-zero chances. In the possible-but-not-currently-likely ridings for the Green, all four are currently projected NDP. This adds a significant level of uncertainty to the projections for the party of John Horgan. All it takes for the BC NDP to pass from 46 seats (a majority) to 42 (a minority or a defeat) is a concentrated Green surge on the Island. Advance voting started this weekend - I voted on Saturday in False Creek- and early turnout data from Election BC isn't super indicative of any trend. Esquimalt-Metchosin's turnout seems on the rise, which would be a good news for the Green, but Saanich North and the Islands seemed more quiet after the first day. I'll keep an eye on it with the updated data tomorrow. If there is indeed a Green surge on the island, I believe it should at least be visible in an increased turnout. That's pretty much it for now. I'll work hard this week to be able to provide the best possible projections next Sunday or Monday. Hopefully we get a couple of polls. But I strongly suspect that this election will remain uncertain until the very end.